When we’re doing color management consulting and training, we frequently print test images like the one shown with this post. We print a test image when we are in the process of establishing a baseline for color quality. The goal is to know if we’ve achieved a known good print condition by assessing the images visually and the control targets by measuring and evaluating against industry specifications. Which came first – the visual or the measured? We’re often asked which is more important for consistent repeatable color: the visual, subjective evaluation or the measured, objective evaluation? The answer is, yes. Yes, as in both are equally important. It’s difficult to not perform at least a cursory visual evaluation as the print is coming off the device. It’s just human nature to do so. The upside to this is that significant print and/or color problems are pretty easy to see. When that happens, it’s often not worth the time and effort to measure the objective targets. Instead, determine the cause of the print/color issues and resolve those before reprinting and measuring the targets. On the other hand, an image might look great; but upon measurement and evaluation we find that the print is just a little bit out of specification. It might not even be so far out as to be a problem for day-to-day production. The problem is that if we turn over this profile for production right at the outside margin for error, then any further drift could quickly result in color that is no longer consistent, predictable and repeatable. So you can see why both visual and numeric evaluation are critical. 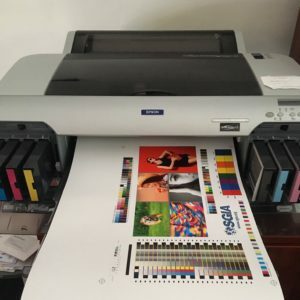 Once we’ve established a known good print condition for this device, we can reprint the same image anytime and evaluate it both visually and numerically. When it fails to be within specification, we know it’s time to make adjustments before continuing with production. To learn more about this and other color management topics, be sure to check out all the training opportunities we have available throughout the balance of the year. Click here for upcoming color management training opportunities.